For years and years, Mom didn't make this pie on Thanksgiving or Christmas because many of my siblings don't particularly care for it. Mom and my brother Jimmy were the only ones who really loved it. Finally, one year she said "You know what? I like it, so I'm making it!" And that was that. I have to say, although I didn't like it as child, I do enjoy it now. I guess my taste buds have become a little more sophisticated. Or maybe I've just grown to enjoy those falls spices a little more. I think some people are afraid to try it because they think there's meat in it. Well, at one time, there really was meat in mincemeat, but that's not the case any more. Mincemeat is a mixture of chopped dried fruit, spices, and distilled spirits. English recipes from the 15th, 16th, and 17th century describe Mincemeat as a mixture of meat and fruit used as a pie filling. By the mid-20th century the term was used to describe a similar mixture that does not include meat but is basically a mixture of fruits and spices such as cloves, nutmeg, mace and cinnamon, usually with added brandy or wine. So, there you have it. Whenever Mom made her Mince pie, she always added finely diced apples. She once told me that the spices can sometimes be a little overpowering to the pie, and the apples help to balance everything. I've made it with apples and without, and of course, Mom was absolutely right. The apples really make a difference. So, since Mom loved this recipe, it deserves a place in my recipe archive. If you're all about apples, raisins, and fall spices, then this is DEFINITELY the pie for you! Pour the jar of mincemeat into a large bowl. Add diced apples and flour. Stir until well combined. Set aside. Roll out pie crust and place in a deep dish Pyrex pie plate, making sure to leave an inch hanging over the edge. Pour the mincemeat/apple mixture into pie crust. Cut up butter into small pieces. Place them evenly on top of the pie filling. Roll out second pie crust. Place over pie. Press edges together. Trim excess pie crust. Crimp edges between your fingers to make a decorative edge. Cut slits in the top crust so that steam will vent. Bake for 15 minutes. Reduce heat to 350F. Bake 20-30 minutes longer or until golden. Once it has cooled completely, dust the top with powdered sugar. I always use Fuji apples because they're crisp and sweet, which is exactly what you want. 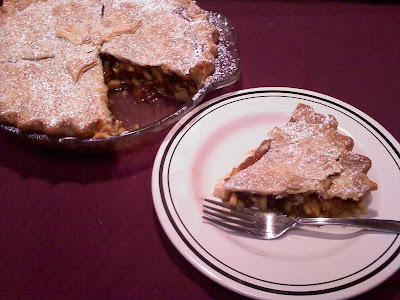 I wouldn't use a tart apple in this particular recipe, since the point of adding the apples is to sweeten the pie. No, I've never made home made mincemeat. Maybe one of these days I'll look into it, but for now, I'll just use the jar like Mom did.